Vincent Irizarry was raised in Long Island, N.Y. He was interested in the arts as a young child. While studying piano at Berklee College of Music in Boston, he developed a fondness for acting. Before getting his first professional role with the New York Shakespeare Festival, he starred in Boston-based productions. Irizarry’s first daytime role, as GUIDING LIGHT’s Brandon “Lujack” Luvanoczeck, won him a 1986 Daytime Emmy nomination. He went on to star in SANTA BARBARA as well as appear in prime time on L.A. LAW, BEVERLY HILLS, 90210 and MURDER, SHE WROTE. In 1989, he married fellow SB star Signy Coleman (ex-Celeste; also ex-Teri/Annie; ex-Hope, THE YOUNG AND THE RESTLESS). He divorced Coleman in 1992 and married Avalon. On the big screen, he starred with Sissy Spacek in 1985’s MARIA, and with Clint Eastwood in 1986’s HEARTBREAK RIDGE. In 1997 Irizarry landed in Pine Valley for what was supposed to be a short-term role as the evil Dr. David Hayward. The character became so popular that he returned after a brief break and won a Soap Opera Digest Award for Outstanding Villain in 1999. After a surprising ouster from AMC, he quickly landed the role of the mysterious David Chow on Y&R, where he stayed from 2006 until August 2008. When Genoa City’s David was killed in a car crash that also took the life of Victor’s new wife, Sabrina (Raya Meddine), AMC came calling again and signed Irizarry up for another stint as Dr. Hayward. 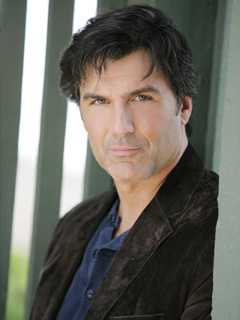 His official Web site is www.vincentirizarry.com. Played Paul McCartney in the off-Broadway production Lennon. Was waiting tables and sleeping in the back of New York's 13th Street Theater when he won the role of GL's Brandon Luvanoczeck. Turned down a screen test for ANOTHER WORLD a year before going to GL because he was up for a lead role in Francis Ford Coppola's The Outsiders. Spends his free time supporting the nonprofit Habitat for Humanity. Is one of six children. Actor Roundup: Which Co-Star's Work Has Impressed You Recently? How Well Do You Know The DAYS Stars?